I came across a recipe for Cranberry Pomegranate Sauce in the November issue of Hannaford's Fresh magazine, and decided to swap out our usual this year. 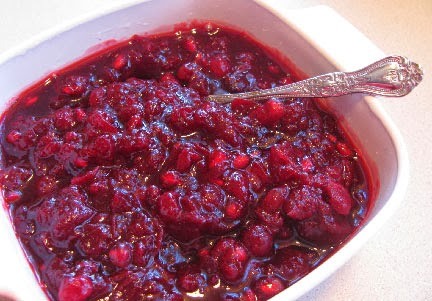 Well, one of the usuals, since we alternate between a very good traditional Cranberry sauce, a slightly sweeter Cranberry apple sauce, and a piquant Cranberry chutney. Well, now we've got another to throw into the mix! I did vary the recipe somewhat, and if you'd like to check out the original, it can be found at the top link. In a large saucepan, combine the cranberries through the zest and bring to a boil. Reduce heat and simmer low until most of the cranberries have popped, stirring from time to time. Remove from heat and mash some of the berries if desired. Let cool completely, and then stir in the pomegranate seeds.